Steve Jobs has insisted that the rush of 7 inch tablets that are beginning to appear are too small to rival the iPad, and also believes that the Apple tablet will begin to eat into laptop sales. Jobs, speaking at the quarterly Apple earnings call, insisted that Apple had the computing "tiger by the tail" with the iPad, and dismissed the arrival of 7 inch tablets. "This size isn't sufficient to create great tablet apps, in our opinion," said Jobs about 7 inch tablets. "While one could increase the resolution of the display to make up for some of the difference, it is meaningless unless your tablet also includes sandpaper, so that the user can sand down their fingers to around one quarter of their present size," he joked. His dismissal of the likes of the Samsung Galaxy Tab came with the proviso that Jobs believes that the 10 inch screen of the iPad is the smallest tablet size that can "express the software". "Software developers aren't gonna deal real well with all these different sized products, when they have to redo their software every time the screen size changes," he added. 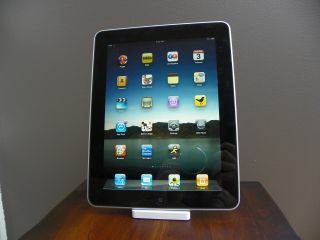 A lot has been made of the iPad's impact on laptops and Jobs believes that tablets will begin to eat into laptop sales. He suggested that the iPad was "clearly going to affect notebook computers." "The iPad proves it's not a question of if, it's a question of when, he said. "We're already seeing tremendous interest in education and much to my surprise from business. We've got the tiger by the tail here. This is a new model of computing."